WASHINGTON — There have been several news stories recently from Twitter and media outlets involving space rocks, known scientifically as asteroids, debris left over from the formation of the solar system. There are probably millions of asteroids in our solar system, and most of them are located in the Asteroid Belt, an area of space between the orbits of Mars and Jupiter. These news stories involve the alleged death of a man in India due to a meteorite, the potentially very close Earth approach of an asteroid on March 5; and worldwide preparations for Asteroid Day on June 30. A death by meteorite in India? Through email sources and Twitter, I became aware of reports two days ago indicating that a bus driver in India had been killed and three others were injured due to a meteorite. There was also damage to some bus windows and all of this happened in a very small area. Viewing the pictures provided by news outlets and reading reported witness accounts, it was highly improbable to me and others in the meteoritic community that this was a viable report. The alleged meteorite crater(s) were far too small. There were no witnesses or photographic evidence of a bolide, a very bright fireball that explodes and has a high probability of producing meteorites. The New Indian Express reporting refers to a much more believable cause of death as expressed by police: detonation of old dynamite sticks thrown into a fire. A colleague within the meteoric community called me today and said he had seen a video of the victim’s body, which showed burn injuries consistent with trauma caused by dynamite or an explosion of some kind. I have viewed an alleged picture of the victim and concur. A meteorite will not cause burn injuries under any circumstances. Proper death investigation protocol should include the autopsy of the victim, medical examination of the injured, forensic examination and analysis of the damaged bus windows, craters and any recovered debris attributed to the incident. This is the only way such incidents can be resolved. If such a protocol is followed, it should close this latest chapter of “a meteorite is involved” which actually happens a lot although this is the first alleged death related incident I am aware of in modern times. While there has been no reliable report of a meteorite-caused death in modern history, there have been people injured by falling space rocks. Remember the 1,600 people reporting injuries caused by the Feb. 15, 2013 Chelyabinsk bolide? One woman in 1954 was hit by a meteorite that fell through her roof, which caused a deep bruise on her hip. In 2010, the DMV had its own meteorite impact event involving a roof with no injuries at a doctor’s office in Lorton, Virginia. It’s certainly possible for people to be killed during a bolide event, but the odds are pretty high compared with other potential causes of death. As we get closer to March 5, the ‘net and Twitterverse will probably start to trend on THE.END.OF.THE.WORLD.IS NEAR! (again). The culprit this time is an asteroid designated 2013 TX68 that has the potential to pass very, very close to Earth’s surface – 11,000 miles or at 9 million miles. NASA’s Center for NEO Studies (CNEOS) at the Jet Propulsion Laboratory in Pasadena, California has determined that there is zero chance for an impact on this flyby. 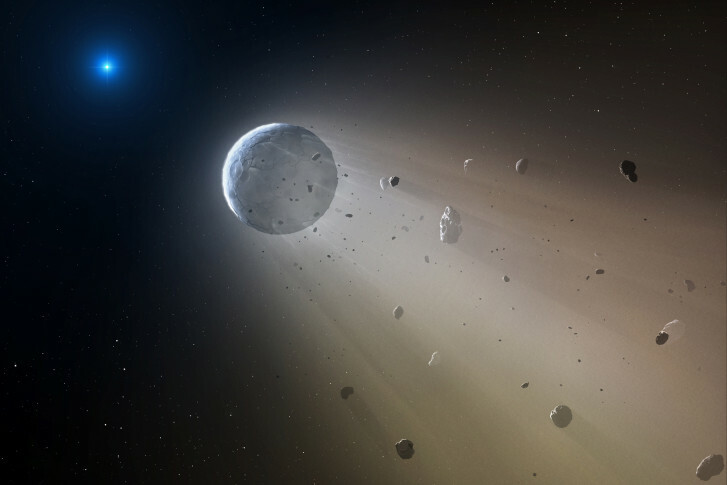 This space rock passed by Earth before in 2013 and will continue to do so in the future. Astronomers were only able to get a few observations to determine its orbit, which is why we have such a wide spread in the flyby distance. As you can see by the JPL news release, there is a very small chance of an impact — 1-in-250-million in 2017 — and is likely to get even smaller with more observations to pin down its orbit more precisely. Astronomers hope to get enough observations of this rapidly retreating (and dim) asteroid that will allow for a more precise determination of its orbit. Then and only then will NASA be able to determine if 2013 TX68 poses any threat to us in the future. Even though it is only 30 meters across, 2013 TX68 has twice the explosive potential of the 20-meter Chelyabinsk bolide or about 1 million tons of TNT. This could cause damage and injuries to a city and its population. I think you can see why this could morph into an “end of the world” tizzy in social media. Again, ZERO chance of impact on March 5th and a very small, if at all chance in the coming years. ESA held a 90 minute teleconference today to announce the activities and partners for Asteroid Day 2016 at asteroidday.org. As explained in ESA’s press release, Asteroid Day will be held June 30 – the anniversary of the largest impact event on Earth in recorded history, at Tunguska, Siberia, in 1908. The first Asteroid Day was launched in 2015, inspiring more than 150 events worldwide, attended by tens of thousands of scientists, academics and members of the public. Events are organized independently by museums, research institutes, government agencies, universities, astronomers, filmmakers and concerned citizens. You can watch the replay of the teleconference here. June 30th is a significant date in the history of Earth impacts as on that date in 1908 a 5 to 10 megaton airburst occurred over Tunguska, Russia. 800 square miles and 80 MILLION trees were flattened – there were no known fatalities. This is the largest impact to occur in modern times. Asteroid Day 2016 will have worldwide participants, events and distinguished sponsors. There may be local events in the DMV like there were last year. I will be monitoring the Asteroid Day Schedule for any local events or news. These stories highlight the connection between space rocks and society on a worldwide basis. We need to continue investigating alleged incidents, scanning the skies for potential threats, and responding to them both appropriately. Humanity is developing planetary defense capability, albeit slowly at present. More resources to find these space rocks, our first and primary step in planetary defense, are becoming available. NASA is developing its manned spaceflight program that can go beyond Low Earth Orbit to the Moon, Mars and yes, asteroids. Follow my daily blog and @SkyGuyinVA to keep up with the latest news in astronomy and space exploration. You can email me at skyguyinva@gmail.com.